I’m a newbie Android developer, having started about a month ago. I started by picking up a beginners Android book (for dummies!) and seeing how far I could get with it. My device is a relatively crappy Samsung Galaxy Ace smartphone. I got the SDK and environment set up and got a “Hello World” running without running into trouble. Then I worked through some example apps from the book, again without too much difficulty. After that, with a very basic understanding of Activities, Intents, Views, and all that, I deviated from the beaten path, using Google when I needed help (which happened pretty often). I wanted to make something new (not copying someone else’s app idea) but still do things typical apps would do (better chance of Googling for help). This is an app for League of Legends players. In this game, there are more than 110 champions, each having 5 abilities — each with a unique name. This results in about 600 distinct abilities. 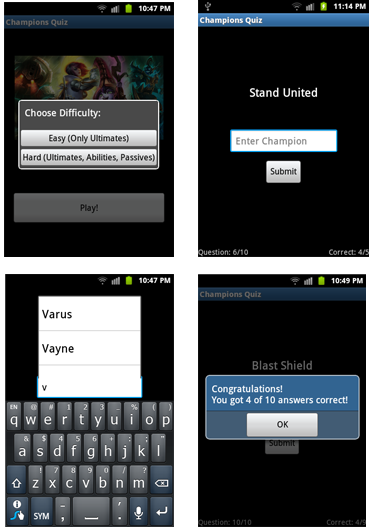 The goal of the quiz is to match the correct champion name, given the ability name. 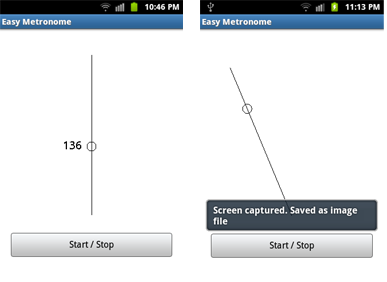 This app is a fully functional, animated metronome. Drag the circle up and down to set the tempo like on a real metronome, and press a button and it goes. The idea is, if you take a look on the Google Play Store for the metronome apps, they tend to have sliders, buttons, many needless customization options, and advertisements, making the interface feel extremely cluttered, given the small screen of the phone. There’s the good and the bad. The good — Android builds on Java, a language I’m highly familiar with, dampening the learning curve for me. There are lots of tutorials for beginners on the web to get you started. At this stage, if you run into a problem, usually someone else has run into the same problem before; I didn’t have to ask any new Stackoverflow questions. The bad — From the developer’s perspective, the Android tool chain feels buggy and unstable. Perhaps some of these resulted from me doing something stupid, some are annoyances, some are bugs that ideally the developer should never have to deal with. I’ll list a few of these problems, grouping them by where the problem manifests itself. Eclipse can screw up, and when it does, it is not obvious how to fix it. One day, without me changing anything, it suddenly refuses to build the critical R.java file. Fixing it took an hour of painful cleaning, rebuilding, importing, re-importing. Emulators are unusable. They take 15-20 minutes to boot up, and when they do their frame rate is 1-2 fps; they are unresponsive and frequently ignore keyboard input. Ran into an Eclipse bug where Logcat sometimes shows a blank screen. Restarting Eclipse does not fix it. The solution appears to be to instead use the commandline tool “adb logcat”. Ran into an Android bug where only the first line of text in an Alert Dialog is shown. The solution was confusing (involved switching to a different theme) with no explanation given. Ran into an Android bug where the text color was ignored, but only on some devices and not others. I haven’t bothered to find the solution to this. Overall, Android programming is a mildly frustrating experience, compared to what I normally work with. It would be much better without constant minor annoyances and crashes / bugs. I originally wanted to make a bunch of apps and release them for free, but I later realized that Google charges $25 per developer to be able to publish apps. Being very cheap, I didn’t release any of my apps because of this. I could try charging a small price (like $0.99) for the metronome app — I can’t imagine anyone paying for my league quiz app. Or I might make more apps and at some point release them all for free. 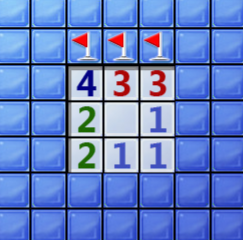 A while ago, I wrote a minesweeper AI. I intended to publish a writeup, but due to university and life and exams, I never got around to writing it. But having just finished my Fall term, I have some time to write a decent overview of what I did. 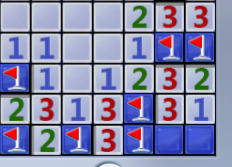 If you’re an experienced minesweeper player, you can probably skip this section. 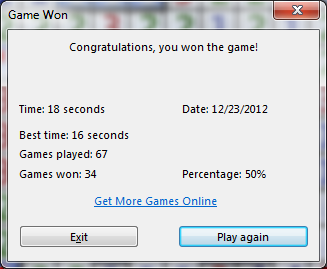 Otherwise, I’ll just give a quick overview of some basic strategies that we can use to solve an easy minesweeper game. We can quickly identify some of the mines. 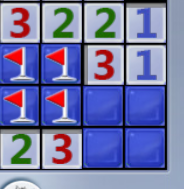 When the number 1 has exactly one empty square around it, then we know there’s a mine there. 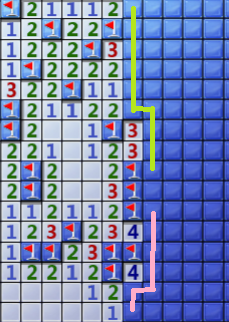 Now the next strategy: if a 1 has a mine around it, then we know that all the other squares around the 1 cannot be mines. Read the board. If we use a screenshot function, we can get a bitmap of all the pixels on the board. We just need to ‘read’ the numbers on the screen. Luckily for us, the numbers tend to have different colors: 1 is blue, 2 is green, 3 is red, and so on. Compute. Run the calculations, figure out where the mines are. Enough said. Click the board. This step is easy. In Java, we can use the Robot class in the standard library to send mouse clicks to the screen. There’s not a whole lot to this step, so I’m going to skim over it quickly. At the beginning of the run, while we have a completely empty grid, we invoke a calibration routine – which takes a screenshot and looks for something that looks like a Minesweeper grid. Using heuristics, it determines the location of the grid, the size of a grid square, the dimensions of the board, and things like that. Now that we know where the squares are, if we want to read a square, we crop a small section of the screenshot and pass it to a detection routine, which looks at a few pixels and figures out what’s in the square. The color for the number 1 is very close to the color of an unopened square: both are a dark-blue color. To separate them apart, I compared the ‘variance’ of the patch from the average color for the patch. The color for 3 is identical to that for 7. Here, I used a simple edge-detection heuristic. The trivially straightforward algorithm is actually good enough to solve the beginner and intermediate versions of the game a good percent of the time. Occasionally, if we’re lucky, it even manages to solve an advanced grid! 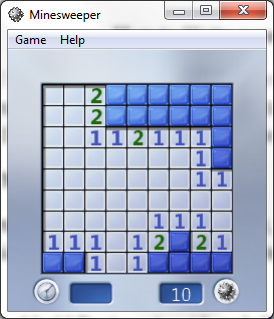 When humans play minesweeper, we compete for the fastest possible time to solve a grid of minesweeper. So it doesn’t matter if we lose 20 games for every game we win: only the wins count. Win as many games as possible. Using the straightforward method, we seem to be stuck. 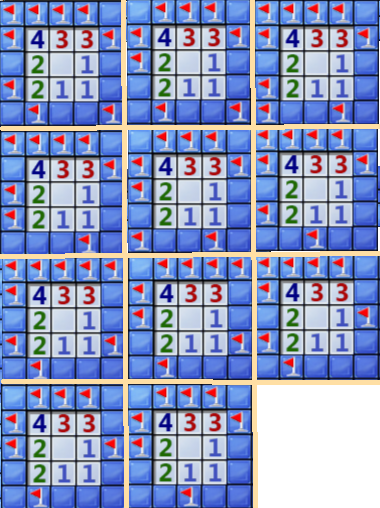 Up until now, whenever we mark a square as having a mine or safe, we’ve only had to look at a single 3×3 chunk at a time. This strategy fails us here: the trick is to employ a multisquare algorithm – look at multiple different squares at once. Let’s click them to be sure. And voilà. They’re empty. The rest of the puzzle can be solved easily, after we’ve made the deduction that those two squares were empty. It’s difficult to make the computer think deductively like we just did. But there is a way to achieve the same results, without deductive thinking. The idea for the Tank algorithm is to enumerate all possible configurations of mines for a position, and see what’s in common between these configurations. This works even better than human deduction! We always try to apply the simple algorithm first, and only if that gets us stuck, then we bring in the Tank algorithm. To implement the Tank algorithm, we first make a list of border tiles: all the tiles we aren’t sure about but have some partial information. Now we have a list of border tiles. If we’re considering every possible configuration, there are of them. With backtracking, this number is cut down enough for this algorithm to be practical, but we can make one important optimization. If you look carefully, whatever happens in the green area has no effect on what happens in the pink area – we can effectively consider them separately. How much of a speedup do we get? In this case, the green region has 10 tiles, the pink has 7. Taken together, we need to search through combinations. With segregation, we only have : about a 100x speedup. Practically, the optimization brought the algorithm from stopping for several seconds (sometimes minutes) to think, to giving the solution instantly. Are we done now? 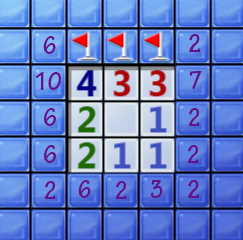 Can our AI dutifully solve any minesweeper grid we throw at it, with 100% accuracy? One of the two squares has a mine. It could be in either, with equal probability. No matter how cleverly we program our AI, we can’t do better than a 50-50 guess. Sorry. The Tank solver fails here, no surprise. Under exactly what circumstances does the Tank algorithm fail? 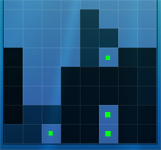 If it failed, it means that for every border tile, there exists some configuration that this tile has a mine, and some configuration that this tile is empty. Otherwise the Tank solver would have ‘solved’ this particular tile. In other words, if it failed, we are forced to guess. But before we put in a random guess, we can do some more analysis, just to make sure that we’re making the best guess we could make. From the 3 in the middle, we know that three of them are mines, as marked. But marking mines doesn’t give us any new information about the grid: in order to gain information, we have to uncover some square. Out of the 13 possible squares to uncover, it’s not at all clear which one is the best. Our best guess would be to click on any of the squares marked ‘2’: in all these cases, we stand an 82% chance of being correct! The mine counter. Normally, this information isn’t of too much use for us, but in many endgame cases it saves us from guessing. Here, we would have a 50-50 guess, where two possibilities are equally likely. 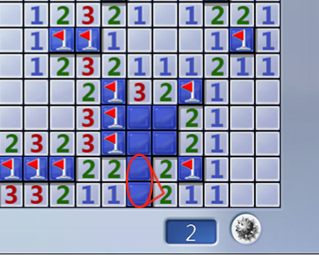 But what if the mine counter reads 1? 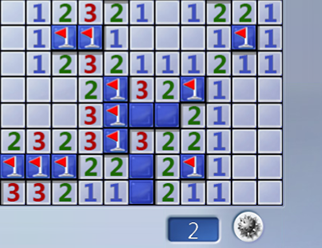 The 2-mine configuration is eliminated, leaving just one possibility left. We can safely open the three tiles on the perimeter. Now on to our final tactic. So far we have assumed that we only have information on a tile if there’s a number next to it. For the most part, that’s true. If you pick a tile in some distant unexplored corner, who knows if there’s a mine there? The mine counter reads 2. Each of the two circled regions gives us a 50-50 chance – and the Tank algorithm stops here. Of course, the middle square is safe! To modify the algorithm to solve these cases, when there aren’t that many tiles left, do the recursion on all the remaining tiles, not just the border tiles. The two tricks here have the shared property that they rely on the mine counter. 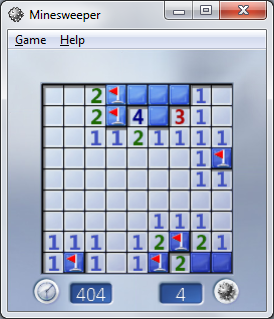 Reading the mine counter, however, is a non-trivial task that I won’t attempt; instead, the program is coded in with the total number of mines in the grid, and keeps track of the mines left internally. At this point, I’m convinced that there isn’t much more we could do to improve the win rate. The algorithm uses every last piece of information available, and only fails when it’s provably certain that guessing is needed. How well does it work? We’ll use the success rate for the advanced grid as a benchmark. The naïve algorithm could not solve it, unless we get very lucky. Tank Solver with probabilistic guessing solves it about 20% of the time. Adding the two endgame tricks bumps it up to a 50% success rate. If some digit in Y coincides with a digit in X (in the same position), then the guesser scores an A. If some digit in Y exists in X but is in the wrong place, then the guesser scores a B. For instance, if X is 1234 and we guess 2674, we get an A and a B, because the 4 is in the right place, and the 2 is one of the right numbers but isn’t in the right place. This proceeds until the guesser gets the exact number. When humans (or at least beginners) play the AB game, they usually do some form of uncoordinated trial and error, which gets the right answer after some large number of moves. This takes anywhere from about 8 to possibly 30 guesses. 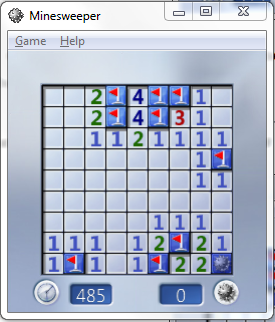 When I played this game with a friend, I didn’t have a very systematic strategy, but I wondered if a computer program could solve the game, always entering the optimal guess. My first approach happened to work fairly well. Simply, the computer keeps track of a list of all possible numbers that the answer can be. At random, the computer guesses one of the numbers, and upon receiving feedback, eliminates every number in its list that doesn’t match that feedback. Quickly it eliminates whole swaths of combinations and arrives at the answer. It took only 5 guesses for the computer to narrow down the choices to the only possible answer (8021). The computer’s average of five or six is much better than a human can normally do! (although I haven’t researched possible human algorithms). At this point you may begin to wonder if this strategy is the optimal one. Unfortunately, it is not — and I only need one counterexample to demonstrate that. Suppose that instead of four numbers, you were allowed to choose 4 letters from A to Z. You choose the combination ABCW. Now suppose that the computer ‘knows’ that the first three letters are ABC — that is, it has eliminated all other combinations except for ABCD, ABCE, …, ABCZ. By the random guessing algorithm, the computer is forced to guess ABCJ, ABCP, etc, until it eventually hits on ABCW at random. This may take a very high number of guesses. A smarter strategy would be to guess combinations of four unknown letters, say DEFG, then HIJK, etc. Instead of eliminating one letter, you eliminate four letters at a time. Although some guesses have no chance of being correct, the number of guesses required is fewer in the long run. // Does cc1 and cc2 together match the pattern? // If repeats are allowed, cc2 is matched against cc1. Hello all; I have just returned from Mathcamp, a five week math program for high school students. I’m not going to write in detail about life at Mathcamp, other than that it was amazing in every way. Generate a main melody using a bunch of rules: ie, what notes are allowed to go with each other, what rhythms are allowed to go with what notes, etc. Using the main melody as a sort of a baseline, generate one or more counterpoint melodies: a counterpoint melody is constrained by the same rules that the main melody must follow, but also has to harmonize with the existing melody, thus being constrained by another set of rules. Once all the notes are generated, the program simply uses some library — in our case JFugue — to play the notes through the speakers. The bulk of our time was spent implementing, tweaking, and debugging the rules and the various other substeps in the above process. The source code, mostly written by myself over about two weeks, is available as a Google Code project. Is 2011 a special number? Today is the first day of the year 2011. 2011 is a prime number. Not only that, but according to numerous math bloggers and twitterers on the internet, 2011 is the sum of 11 consecutive primes — that is, 2011 = 157 + 163 + 167 + 173 + 179 + 181 + 191 + 193 + 197 + 199 + 211. Furthermore (as I already said), 2011 is prime. 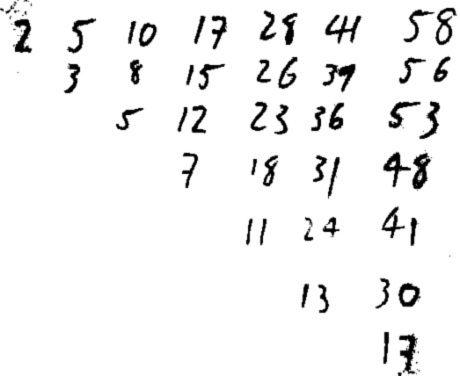 Naturally I wonder, how rare are these numbers — numbers that are prime but also a sum of a bunch of consecutive primes? This seems like a problem easily solved with some programming. Let us write P(n,k) as the number of primes less than or equal to n that can be written as a sum of at least k consecutive primes. How big is P(2011,k) compared to , the number of primes less than or equal 2011? Because of the way I arranged the numbers, we can see that the bottom diagonal are all the numbers that can be written as a sum of 1 prime (obviously, the prime numbers), then the next row are all numbers that can be written as a sum of 2 primes, and so on. 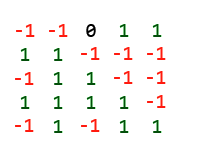 If we want to compute P(n,k) we simply list enough prime numbers to complete this table, take everything above a diagonal, and filter out all the duplicates. It turns out that P(2011,3) = 147 and since there are 305 primes less or equal to 2011, roughly half of all primes under 2011 can be written as a sum of at least 3 consecutive primes. Hardly a special number at all! Even if we insist on a list of 11 consecutive primes, there are still 56 primes less than or equal to 2011 that can be written as a sum of 11 consecutive primes, about 1 in every 5 primes. The 2010 International Olympiad of Informatics (IOI) finished today. Probably the highest high school level programming competition in the world, with participants from many countries. Anyways. An interesting problem was Task 3 of Day 1, titled Quality of Living. 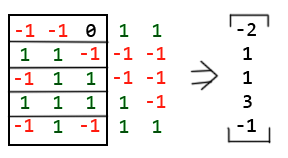 In a grid of rows and columns, each cell is given an unique quality rank, as in 1 being the best, 2 being the second best, and being the worst. Given and as odd numbers with and , the task is to choose a rectangle of height and width so that the median quality rank of the rectangle is at a minimum. 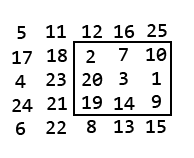 The best, or smallest median of all possible rectangles in the configuration is the one shown, with a median of 9. Since no rectangle has a smaller median, 9 is the answer to this problem. For an arbitrary array and parameters and , how should a program calculate the smallest median? Let’s consider brute force. There are possible positions for the rectangle to be placed, and we will check each of them. Checking for the median requires sorting, which is of complexity . In order to earn full points for this problem, the program needs to handle 3000 x 3000 grids in under 10 seconds. In the worst case that and , this amounts to over 2 million sorts, or many billion operations, which is clearly too much. An efficient solution takes a completely different approach. There is no way to possibly calculate the median for every position. Instead, we conduct a binary search on , the smallest median. Let us arbitrarily ‘guess’ a value of . For each element on the grid, we assign it -1 if it’s smaller than , 1 if it’s greater than , or 0 if it is equal to (and therefore is) . Now for any sub-rectangle, we can determine if its median is smaller or larger than our guess by summing it up. If its sum is negative, then its median is smaller than our guess; if it’s positive then the median is larger than our guess. If the sum is exactly 0, it means that the number of elements smaller is equal to the number of elements bigger, implying that the median of this sub-rectangle is our guess. If there is any sub-rectangle having a negative sum, then our guess is too big. That particular sub-rectangle has a smaller median, so our median can’t be the smallest anymore. On the other hand, if all sub-rectangles have a positive sum, then our guess is too small. We know we’ve got it when none of the sub-rectangles are negative, and at least one sub-rectangle has a 0 sum. The plan is, we start from the top of the first column and go down it, and when we reach the end we start at the top of the next column, and so on. We keep doing this until we reach the end. Now to find the sum of the first sub-rectangle, we add up -2 and 1 and 1, getting 0. Then we can use this result to find the sum of the next sub-rectangle down. Removing -2 and adding 3, we get 5, which is the sum of it. Thus moving down a space can be done with only 2 additions. We use a similar idea when moving right a column after having finished our current one. Rather than calculate wsum over from scratch, we can take the old wsum, and for each row, subtract the removed element and add the new element. This combination of ideas allow us to implement this task very efficiently, well able to solve the 3000 x 3000 subtask within 10 seconds. // Parse data into array. Each cell has its own line. // smaller. Return -1 if it should be smaller, 1 if it should be bigger. // If we have found the smallest median then we return 0. // Does a median m exist at all in this configuration? // Found a negative block: m is too big!